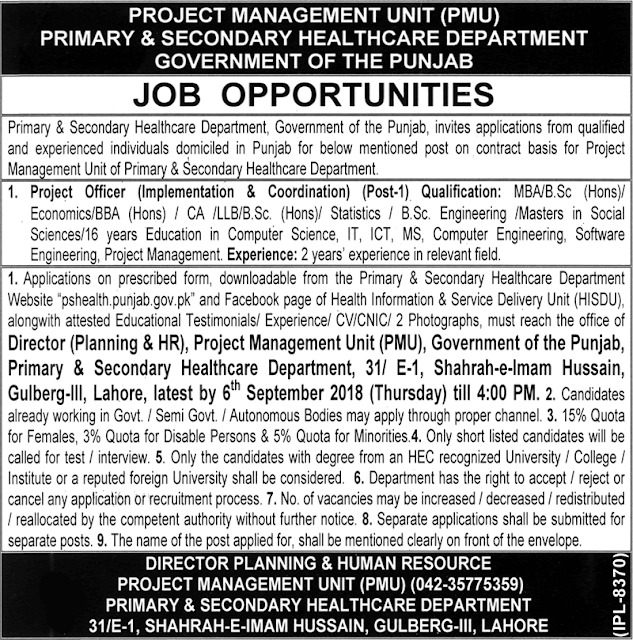 Primary & Secondary Healthcare Department, Government of the Punjab, invites applications from qualified and experienced individuals domiciled in Punjab for below mentioned post on contract basis for Project Management Unit of Primary & Secondary Healthcare Department. (Post-1). Qualification: MBA/B.Sc (Hops)! Economics/BBA (Hops) / CA /LLB/B.Sc. (Hops)/ Statistics / B.Sc. Engineering /Masters in Social Sciences/16 years Education in Computer Science, IT, ICT, MS, Computer Engineering, Software Engineering, Project Management. Experience: 2 years' experience in relevant field. 1. 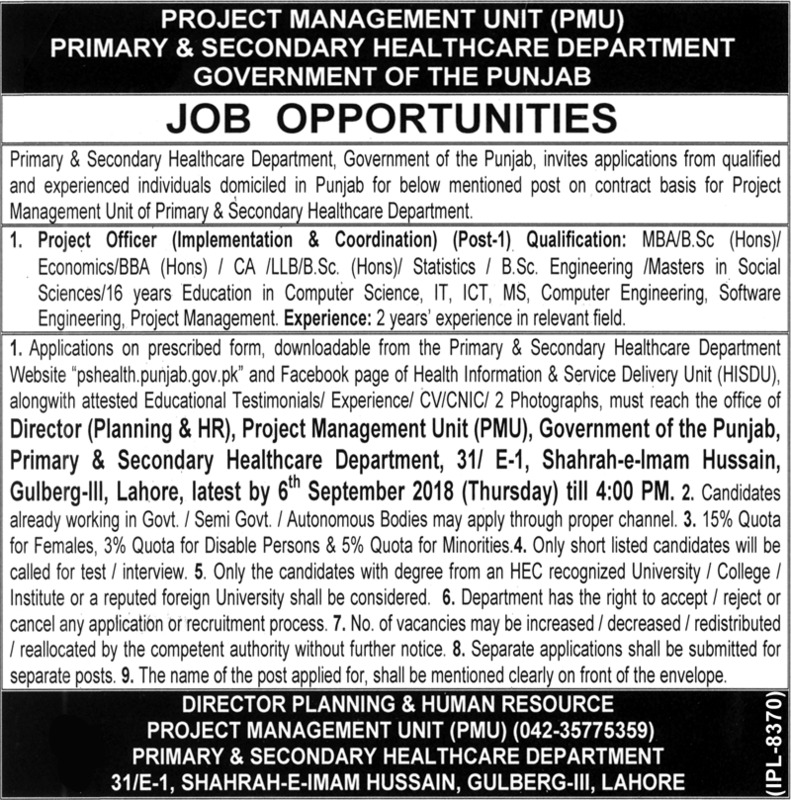 Applications on prescribed form, downloadable from the Primary & Secondary Healthcare Department Website and Facebook page of Health Information & Service Delivery Unit (HISDU), along with attested Educational Testimonials/ Experience/ CV/CHIC/ 2 Photographs, must reach the office of Director (Planning & HR), Project Management Unit (PMU), Government of the Punjab, Primary & Secondary Healthcare Department, 311 E-1, Shahrah-e-Imam Hussain, Gulberg-III, Lahore, latest by 6th September 2018 (Thursday) till 4:00 PM. 3. 15% Quota for Females, 3% Quota for Disable Persons & 5% Quota for Minorities. 4. Only short listed candidates will be called for test interview. 5. Only the candidates with degree from an HEC recognized University / College / Institute or a reputed foreign University shall be considered. 6. Department has the right to accept! reject or cancel any application or recruitment process. 7. No. of vacancies may be increased / decreased / redistributed I reallocated by the competent authority without further notice. 9. The name of the post applied for, shall be mentioned clearly on front of the envelope.